Splitting an order is useful for breaking up fulfillments, shipping certain products separately, or creating a backorder. 9.) 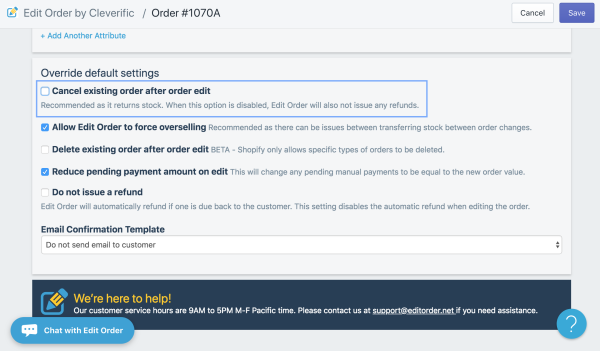 In the Override default settings section, leave "Cancel existing order after order edit" checked, but also manually check the box that says "Do not issue a refund". Splitting an order into two separate orders is a manual process as of now, but it is on our product roadmap to add a feature in the future that will allow merchants to to split orders much more easily.